Only nail paint is not enough. You have to do extra art for your nails, which gives pretty look to your nails. If your nails are long in shape, it gives fancy look to your nails. Here is the simplest technique of nail art, which can be used anytime and anywhere…. 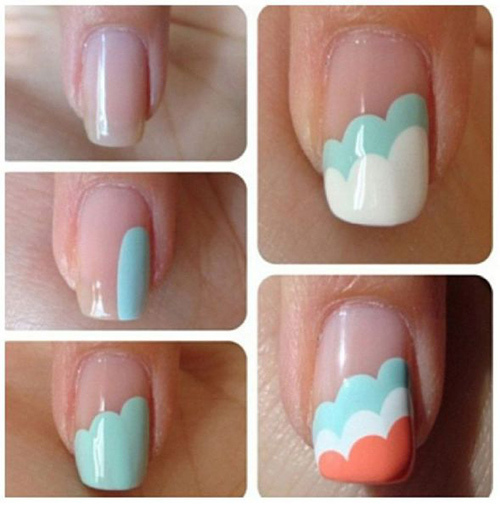 This nail art is the simplest art which anyone can try even though the person begins the first time. You do not need extra tools. Only more than two nail polish colors you need to make available. You can choose the color as per your choice. Always keep your nail clean and dry. Apply a base coat of nail polish on your nail for protection purpose. Use pastel color, which you select for a base, create a vertical stripe on one corner. Leave some space from the cuticle. Create one more shade with same nail polish, from the center, a little lower. Create one more stripe, again lower. Repeat in the same manner with the other color, but start from the below the first color. If you want to add one more color in the same direction. Now will see the nail art with only nail polish. Here we start the adding tools at the time of nail art. With the help of tools, you can paint your nail easily within a short time. Paint your nails with light pink or English color as a base color. Paint white color over the nail in half curve shape as shown in the image. After drying, use nail striper or a paintbrush dipped in black nail polish, create a line over, where light pink and white color meet. Create a bow, just side of the nail. Stick rhinestone middle of the bow. Allow to dry it. Seal it with top coat. It looks very beautiful. This is very funny painting, you can do on your nails. There is no any requirement of the fine and neat design. First, paint your nails with white color nail polish. Take blue, yellow and pink color in one plate separately. Take separate straw for each color. Dip the straw into blue color and blow it on the nail bed. Do it same for all nails. Repeat same for other colors. At a time use one color for all nails and allow to dry it. Use cotton buds for cleaning the extra nail paint around the nails. 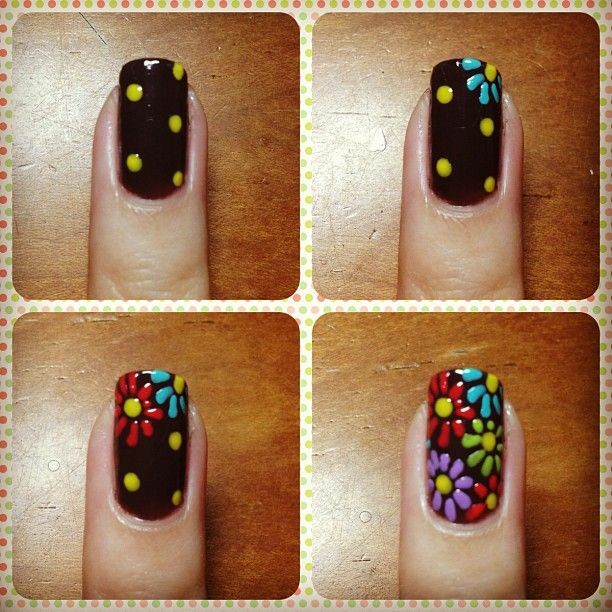 When you see this nail art it seems complicated, but it is very easy to do it. You can use any color combinations, which you like. You can take pink color as a base for your nails. Place the tape properly on your nail bed with half flower cut. Paint over it with black nail polish. Wait for 5 minutes and slowly remove the tape. Again allow to dry it. Again with the small shape of flower cut tape stick on the nails as shown below. Seal it with top coat. This nail paint has the patience to create it. This needs to draw very neatly and carefully. When you have free time and want to paint something new, that time you can apply this type of art. Apply a base color on your nails and allow to dry it. Use a dotting tool or bobby pin for creating a small flower on the nail bed. First, start a flower with a small dot. Draw small petal around the dot. Create small dots around the middle dot and start to spread like a petal. Same steps apply for other flowers. Fill up whole nail bed with the flowers.